This is vegeterian version. You can make your own protein meal with it, if you add scrambled eggs or grilled chicken with it. 2 tsp of red hot sauce. Now add onions let them turn to light brown. Add Garlic to it and then let garlic infused it flavor in pan. Now add all the Cole Slaw and keep on stirring with tongs so that it’s light sautéed / fried all over. When it is thoroughly cooked add soy sauce, orange juice. Stir it till is coated with the juice and soy sauce. Take it out of heat and add red hot sauce. Plate it on the serving plate and garnish with roasted peanuts and some sesame seeds . Enjoy warm salad with a twist, after this you will not only be full but also you will not be guilty of eating any extra calories in regular salads. 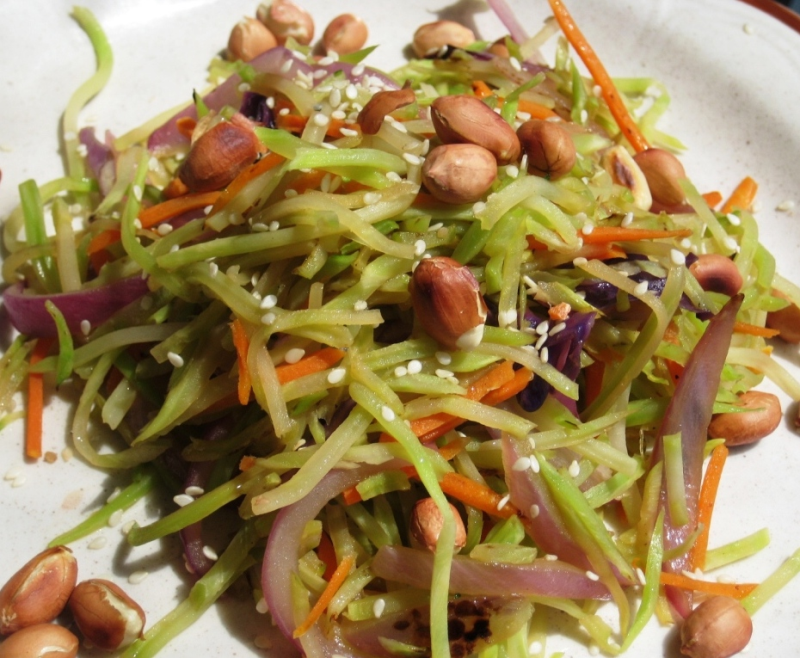 This Salad is purely full of fiber and high nutritional value as it has very very less fat. Wow!.Yet another great recipe from u Chitra with a neat picture.